IPL 2019: Dhoni could only score 12 off 21 balls against MI. IPL 2019: It is no secret that Chennai enjoys one of the biggest fan followings in the IPL and the biggest reason for that is MS Dhoni. He enjoys a huge fan base and is a massive crowd puller. Fans got a glimpse of that in the stands of Wankhede when Dhoni was dismissed for 12 off 21 balls in a 171 chase. 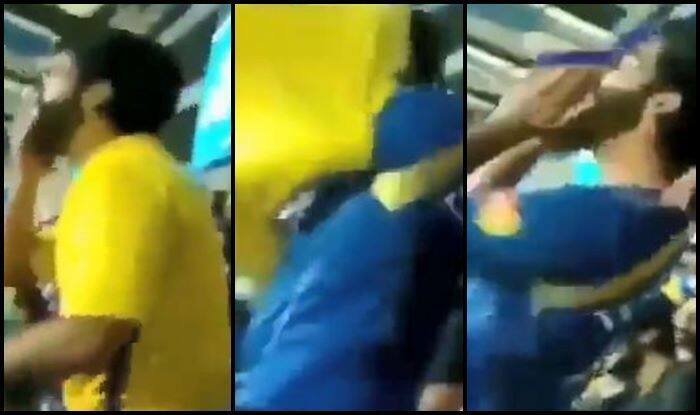 A die-hard Dhoni fan wearing the yellow jersey and rooting for his idol slipped into the blue Mumbai jersey as soon as his hero was dismissed. This is another testament of Dhoni’s never-dying following.